Horace’s is the less common of our two larger duskywings, Juvenal’s and Horace’s. Its east coast range overlaps with that of Juvenal’s Duskywing, but is more southerly (Opler and Krizek 1984; Cech 2005). Massachusetts and possibly southern New Hampshire are currently the northern edge of Horace's Duskywing's range. Scudder and Burgess described and named this interesting species in 1870, and Scudder's 1868 "type specimen", collected by Merrill in Massachusetts, is in the Harvard MCZ. Scudder reports that Horace's had been found only in the southern half of New England, but he did not give complete information about its distribution in Massachusetts. For this state he lists specimens only from Andover, Boston vicinity, Foxboro, Waltham, and Middlesex Fells in the east, and Amherst in the west (1899: 1489), but there are actually many more 19th century locations. Horace's was found in many spots by ace collector F. H. Sprague, including his home base of Wollaston (now in Quincy), where he found it in July 1877, July 17 and 23, 1883; July 19, 1896 (5 specimens), and May 10, 1897 (specimens at MCZ). He determined all these at the time to be Horace's, and not Juvenal's or any of the four smaller duskywings, which he also found. Sprague also found Horace's in Malden (1883), Milton (1885), West Roxbury (1883), and Sharon (1897) (specimens at MCZ and BU). Most notably, Sprague found Horace's in the Connecticut River valley, taking two specimens from Granby July 16, 1885, and one from Montague July 15, 1885. This latter specimen is very significant, since it documents the most northerly and westerly location in the state at that time, and indeed even today. (There is also an undated Scudder-era specimen from Springfield, by A. N. Dimmick, at Yale.) At the turn of the century, Horace's Duskywing was clearly established in eastern Massachusetts and "the valley," although perhaps a bit less common than it is today. Horace’s may have become more common in the twentieth century (Table 2). Farquhar’s comprehensive 1934 review of specimens adds finds from Milton (Blue Hills) (e.g. 1930 specimen at BU), Melrose (Gypsy Moth Lab; 1932 specimen at BU), Stoneham (C. V. Blackburn), and Westwood (D. W. Farquhar), and -- most notably -- as far north as Phillipston (H. H. Shepard) in north-central Massachusetts. In addition, Yale Peabody Museum has specimens from Canton (17 July 1921 P. S. Remington), Sherborn (23 May 1921, no coll. ), Lynnfield (27 May 1921, no coll. ), and Fall River (4 May 1936 W. P. Rogers). The MCZ has specimens from Barnstable (C. P. Kimball, 25 July 1952) and Wellesley (V. Nabokov, May 5, 1942). D. Lennox collected it in 1949 in Waltham; M. Mello collected it in New Bedford in 1962. On Martha's Vineyard Horace's Duskywing was "not rare" in the 1930's and 1940's, with two flights, May and then July-August (Jones and Kimball 1943). Yale Peabody Museum has 14 Vineyard specimens by F. M. Jones, spanning the years 1939-45, with species identification confirmed by J. M. Burns. On Nantucket Kimball and Jones (1943) report at least one Kimball specimen, from May 20, 1940. There is one specimen (n.d.) in the Maria Mitchell Museum on Nantucket. Through the 1970’s and 1980’s, there were many reports of Horace’s Duskywing in the annual Lepidopterists' Society Season Summaries, as collectors were concerned to document the northern edge of its distribution. Edward M. Peters found it in Carlisle in 1970, Dave Winter found it in Medway in 1973 , Darryl Willis found it at the Sherborn power line in 1974 and 1975, and Dale Schweitzer documented it again in Lynnfield and in Medford Middlesex Fells in 1986-1988 (specimens in Yale Peabody Museum). D. W. Winter's 7 May 1983 specimen from Sharon (Norfolk Co.) in the MCZ was re-determined as Horace's by expert J. M. Burns. Gochfeld and Burger suggested that Horace’s Duskywing had increased in New Jersey in the last century, along with the Wild Indigo Duskywing, whereas Dreamy, Mottled, Columbine and Persius Duskywings had decreased (1997:223). The picture seems much the same for Massachusetts. Horace’s Duskywing is at the northern limit of its range in Massachusetts. There have been no Horace’s found so far by the ongoing Maine Butterfly Survey (MBS 12/2013; http://mbs.umf.maine.edu/). In Vermont there are no historic records, the first and only specimen being found in 2007 in southeastern Vermont (McFarland and Zahendra 2010). In New Hampshire there is one pre-1990 record from one southern county (NH Nat Heritage 2010). Horace’s known native host plants are various oaks, in our area probably primarily scrub oak (Quercus ilicifolia), red oak (Q. rubra), and white oak (Quercus alba), but also possibly black oak (Q. velutina) and post oak (Q. stellata) (Scott 1986; Allen 1997). All of these occur in Massachusetts, though ilicifolia is found mainly in barrens habitats, and stellata is native only to the Cape and Islands (Sorrie and Somers 1999). D. Schweitzer reported Horace’s ovipositing on Quercus alba in Middlesex Fells in Medford in 1986 (Lep. Soc. Seas. Sum. 1986). In 2009, photographer Sam Jaffe found Horace’s caterpillars on scrub, black and red oak on Great Blue Hill in Canton and in West Bridgewater (Jaffe 2009). Like Juvenal’s Duskywing, Horace’s is not confined to barrens habitats, but can be found in almost any kind of woods or woods edge which has both oaks and an adequate supply of nectar to support its two broods. North of New Jersey, it prefers dry, rather open, rocky or sandy oak woods and pine barrens. Power line cuts, woods paths, and even gardens and parks are possible habitats. Schweitzer reports that Horace’s prefers to oviposit on small oaks, even seedlings. But Schweitzer (NatureServe 2010) also notes that Horace’s is absent from the more pristine sections of the New Jersey pine barrens due to the lack of summer nectar. Thus suburban gardens and parks may enhance natural habitats. Horace’s has been seen nectaring on dogbane, goldenrod, and mints. MBC records 2000-2007 rank Horace's Duskywing on the low end of ‘Uncommon,” more on a par with Sleepy Duskywing than with the “Uncommon-to-Common” Juvenal’s Duskywing (Table 5). The MAS Atlas account found that Horace’s was “frequent to common in the Boston area, and probably also in the southeastern counties, during the mid- to late 1980‘s." But the Atlas had found the species only in Worcester County and eastward, and in only 35 out of 723 atlas blocs, and on that basis Horace’s should not have been described as “Common” statewide. 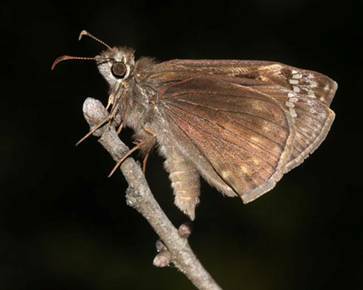 Horace’s is an example of a more southern-based species whose numbers are probably on the increase here, but statistical results are not yet conclusive, perhaps owing to confusion with Juvenal's Duskywing. There was a strong and fairly steady increase between 1994 and 2008 in annual sightings per total trip reports, but a drop in 2009 (Chart 78). The 1992-2008 linear trend is slightly upward (R²=0.040). The absolute (unadjusted) number of individuals reported shows a steady rise 1992- 2009. In some part these results may be attributable to observers’ increasing ability to accurately identify this species. The high readings shown in 1992 and 1993 in Chart 78 are surprising and may be an artifact of a concentration of trips in eastern Massachusetts. In 2007 and 2008, although not 2009, the average number of Horace’s per report of that species increased relative to the average for the preceding years back to 1994. The number of reports of this species, and the maximum number reported, also increased in 2007 and 2008, but not 2009, relative to prior years (Nielsen, Season Summary, MB 2008-2010, No. 30, 32, 34). List-length analysis of MBC data weakly confirmed these findings, showing a 23.6% upward trend for Horace's Duskywing 1992-2010, which was not statistically significant (Breed et al. 2012). BOM-MBC records confirm the concentration of this species in the southeastern and south central parts of our state (Map 78). The great majority of records are from these regions. Horace's reaches its northern limits in this state, as noted; it has not yet been found in Maine, and there are only one or two records from southern New Hampshire. Horace's is reported regularly but infrequently from Essex County north of Boston, with the northernmost reports from Newbury and North Andover. There are also very few records from northern Worcester County, the only two reports being from Petersham (1, 5/29/1999, D. Small) and Princeton (1, 6/29/2013, Wachusett Meadow, C. Kamp). Neither the 1986-90 Atlas nor BOM-MBC has found it north of these towns. The northernmost recent sighting is Newbury Martin Burns WMA, where Horace's Duskywings were extensively photographed by B. Zaremba on 7/24/2011; photos available at http://www.pbase.com/bo_z/image/136695550 . These photos re-confirm the 1980's MAS Atlas report from Newbury, by T. French, 7/19/1987. The second northern report is North Andover Weir Hill TTOR, 4/20/2010, R. Hopping, and two other 2010 reports from North Andover; these re-confirm S. Goldstein's 7/18/1988 report from North Andover. There are other historical reports from North Andover and Andover, and MBC reports from Chelmsford (e.g. 7/28/2011, 2, power line, B. Bowker). In the Connecticut River valley, Horace's Duskywing had been reported from Amherst by Scudder a century ago, and as noted there are other historical specimens from Montague in the north, Granby in the center, and Springfield in the south. But in recent times there have been hardly any reports. The 1986-90 Atlas had only one record west of Worcester County, 5/9/1989, Southwick, T. Fowler, no specimen. This was the first report from the lower Connecticut River valley since Scudder's day (Dimmock specimen, Springfield, n.d., Yale). The next reports are from nearby Hampden (3 on 5/19/1995, G. Howe) and East Longmeadow (2 on 5/6/1998, K. Parker). There have been no reports since from that area, despite many observers. In 2008 came the first recent report from the mid-Connecticut River valley (1, 8/28/2008, Northampton community gardens, T. Gagnon). This same location produced another Horace's in 2010 and another in 2012 (10/1/2012, F. Model, photo). Also in 2012, Horace's was found for the first time on the Northampton NABA Count 7/22/2012, a new species for the Count. The next year it was found again on the Northampton Count (1 on 7/21/2013, Sunderland, E. Barry and W. Howes). Finally, in the northern Connecticut River valley, although it has not been found on any Central Franklin NABA Count, Horace's was photographed at the Montague power line (1f, 5/27/2012, D. Weidemann, BAMONA photoreport), and there is another 6/6/2013 BAMONA photoreport from Franklin County. Horace's is now quite convincingly documented for the upper and lower Connecticut River valley, but there are still no reports from Berkshire County, although some observers think it may occur around Sheffield in the south. Horace's Duskywing has been reported from 77 towns 1991-2013, compared to 166 for Juvenal's Duskywing. On the NABA Counts, it is most often reported from the Bristol, Cape Cod, and Blackstone Valley Counts. Horace's Duskywing has been reported occasionally from Martha's Vineyard in recent records, but only three times in 20 years on the Vineyard NABA Counts. The 2002 Vineyard checklist ranked this species as "rare" at that time, despite historical records. There are seven reports of singles from the island 1992-2008, reports of singles every year 2009-2012, and three Horace's were reported on the Vineyard NABA Count 7/11/1999. These, plus a recent report of 30 on 7/23/2010 in the Edgartown State Forest may cause a re-evaluation of Horace's status on the Vineyard. For Nantucket, the single historical record leads observers to believe that Horace's Duskywing is possible on that island (LoPresti 2011), but there are no recent BOM-MBC or Atlas records. The largest numbers reported from any one site have consistently come from Canton Great Blue Hill, with high counts of 30, 7/16/2007, F. Model and 12, 7/6/2008, E. Nielsen. There are several other reports of approximately 10 from Great Blue Hill. Other productive sites for Horace’s Duskywing have been Dartmouth Lucy Little Rd., 13 on 7/22/2012, M. Mello; Edgartown Manuel Correlus SF, 30 on 7/23/2010, "abundant", M. Arey; Mattapoisett Nasketucket Bay SR, 11 on 7/21/2013, J. Dwelly; Medford Middlesex Fells, 1 on 5/2/2010, M. Arey; Milford power line, 4 on 7/17/1999 R. Hildreth, T. Dodd, B. Cassie; New Bedford Plainville Rd., 4 on 7/22/2012, M. Mello; Newbury Martin Burns WMA max. 4 on 7/24/2011, B. Zaremba (ph. ); Northbridge Larkin Rec. Area, 13 on 8/3/2012, B. Bowker and L. Stilwell; Plymouth/Carver Myles Standish SF, 6 on 5/24/2008 T.Murray et al. ; Sherborn power line, 2 on 8/20/2008 but 18 on 7/22/2012, "an avalanche," B Bowker; Woburn Horn Pond Mountain 2 on 4/28/2013 B. Zaremba (ph. ; mating), max. 5 on 7/2/2012, M. Arey; Worcester Broad Meadow Brook WS max. 5 on 5/12/2001 G. Howe; and Yarmouth Bayberry GC power line, max. 5, 8/6/2011, J. Dwelly. Two broods and a long flight period are shown in MBC records. The first brood flies in May, and the second mostly in July. The first flight is less often reported, probably because of confusion with Juvenal's Duskywing. The bulk of sightings come in the last three weeks in July, when Horace's may be more confidently identified, since Juvenal's is not flying. See http://www.naba.org/chapters/nabambc/flight-dates-chart.asp. Earliest sightings: In the 23 years of BOM-MBC records 1991-2013, the six earliest "first sightings" are 4/20/2010 North Andover Weir Hill, R. Hopping; 4/26/2012 Foxboro Lamson Rd., M. Champagne; 4/28/2013 Woburn Horn Pond Mtn., B. Zaremba (ph. ; mating); 4/28/1999 Topsfield Ipswich River WS, F. Goodwin; 5/6/2011 Plymouth Myles Standish SF, S. Moore; and 5/6/1998 East Longmeadow K. Parker. Four of these early sightings have come just in the most recent four years. The influence of the very warm springs of 2010 and 2012 can be seen. In this 23-year period four of the first reports have come in late April, three have come in the first week of May (5/1 - 5/7), and the rest have come later in May. In most of the years of the 1990's, MBC observers appear to have been missing the early flight of Horace's, or were not separating it from Juvenal's. But the 1986-90 Atlas years produced a number of early records for Horace's, for example 4/20/1986 M. Mello New Bedford and 5/3/1987 Rehoboth K. Anderson, both of which are similar to MBC early dates. D. F. Schweitzer in the Atlas account quotes the earliest known record as April 27, 1949, Waltham, D. Lenox; this is now exceeded in recent records. It would be interesting to compare these dates with those reported 100 years ago. Scudder did not have very precise information. But of all available pre-1900 museum specimens, the earliest date is May 6, 1897, Waltham, C. Bullard; the next earliest is May 10, 1897, Wollaston, F. Sprague. (The earliest capture Scudder mentions is May 18, no year, at Andover.) The late April BOM-MBC reports are thus earlier than reports a century ago. Horace’s Duskywing begins flying a bit later than Juvenal’s Duskywing according to BOM/MBC records. Whereas the earliest reports of Horace’s are 4/20, 4/26, and 4/28 in these records, the earliest reports of Juvenal’s are 4/10, 4/11 and 4/14. Latest sightings. In the same 23 years of BOM-MBC records 1991-2013, the six latest "last sightings" are 10/3/2013 Dartmouth Allens Pond, L. Miller-Donnelly; 10/1/2012 Northampton community gardens, T. Gagnon and F. Model (ph. ); 9/24/2010 Chelmsford power line B. Bowker; 9/19/1999 Waring Field Rockport T. and C. Dodd, D. Savich; 9/18/2006 Marblehead Legg’s Hill, K. Haley; and 9/12/2004 Canton Great Blue Hill, M. Champagne. The latest pre-1900 date is the one Scudder mentions: August 4, when “at Amherst Notch I caught or saw a dozen or two” (1889:1489), Obviously contemporary reports are much later than that. Between 1900 and 1980, the latest record dates were September 20, 1936, Westport, D. Lennox (cited by Schweitzer in the Atlas), and September 8, 1944, Martha's Vineyard, F. M. Jones (Yale specimen). Contemporary reports are now into October, suggesting a lengthening of the flight period. In the 23 years 1991-2013 nine of the ‘last sightings’ are in September, and there are other September reports. All of these are in the period 1999 or later; between 1991 and 1999 all last sightings were in August. In the Atlas account, D. Schweitzer suggests that September reports may indicate a partial third brood here. In the Gulf states, there are three full broods (Opler and Krizek 2004). It seems likely that Horace's Duskywing has been having a partial third brood here in recent years. If climate warming proceeds in our state, it is likely that Horace’s Duskywing numbers and range will continue to expand (Table 6). Horace’s is currently ranked S3 or “apparently secure” in Massachusetts (NatureServe 2010). The probable increase in abundance of Horace’s Duskywing in Massachusetts is opposite to the finding of the Connecticut Atlas, where there were fewer project records than pre-project records (49: 4), and where the species is ranked S2 "imperiled," and is of special conservation concern, since scrub oak barrens habitats are becoming increasingly restricted and fragmented (O'Donnell et al. 2007:58; 294; NatureServe 2010).